December is dedicated to working on our submissions to the Yahara River Writers Contest. All students will be submitting a short story to me and then they will be able to pick one other type of writing to submit: poetry, editorial, or political cartoon (to be discussed and taught the week of December 12th). The first draft for the short story is due to me by December 7th and the Final draft is due the 16th of December. Students are encouraged to work on this outside of school as class time will be limited. This is a county-wide contest where 33 school districts in the area send submissions. All entries will be judged and the top ten in each category, per grade level, will be selected. From each top ten group, a first and second place entry will be identified. All top ten entries will be published in the Yahara River Writers Anthology. and all authors of top ten entries will be invited to attend a workshop on the UW Campus. As Thanksgiving approaches, I have much to be thankful for. The incredible students that are so eager to share their learning, the support of parents for all of our adventures, a team that meets every day and puts the kids first, and a school where we feel like a family. Thank you for everything that you do for me and for us. Math – We are almost done with unit 4 and the test is scheduled for Wednesday November 30th. New groups therefore start December 2nd. This unit is all about division and those math facts are important. The next unit is my favorite topic; fractions! Science – I absolutely loved seeing the students’ thinking in their research paper. Some really hit the mark where others missed a couple of things. Since learning is a process, all students have the opportunity to resubmit missing components to me on Monday. We continue science with our dry mixture challenge on Monday. Social Studies – This week we discussed whether Christopher Columbus was a hero or a villain and it was wonderful to see the nuanced perspectives that started to show up. Perhaps history isn’t as clean-cut as we would like it to be? Students also had a chance to create a route using a compass outside with a video to be posted soon. Reading – Harry is getting to Hogwarts and the kids are disappointed every time I turn it off. We have also been using reading for our How To presentations, which have been wonderful. We have learned so many things this week. Writing – Writing has been focused on the How To presentations this week but we have started a longer writing piece on whether teachers should assign homework or not. The first paragraph is under revision and we continue with it next week. * Please make sure you get our website updates or check the website regularly. This is where I post extra directions, information, and videos for the classroom. If a new project is introduced it often has a post attached to it on the website. * Congratulations to Sophia’s, Priyanka, and Kyra for representing us in the school spelling bee on December 9th. Matthew would also have been a representative but will have moved before then. We are very sad to see Matthew go and will miss his creative spirit. * Also congratulations to Jacob, David, and Sophia Bo. for representing our class in The Thinking Cap Bowl. Their team took 1st in the state and now move on to nationals! 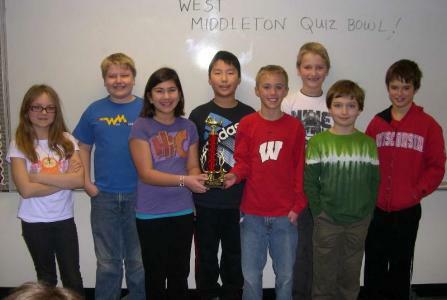 This is the first time a West Middleton team has placed first. *Thank you for all of the box tops, we were in first place last week by about 200 but Mrs. Hannam’s fourth grade is gunning for us. Rumor has it now it might be the top 3 classrooms that get to throw a pie, we shall see. * The students are creating snowman holiday cards to send around the world. We have 29 cards we have to make and send to other classrooms before December 9th. * Thea thinks Santa is coming every day and has discovered that you can put x’s in toy catalogs and Santa may bring it. She has also discovered Christmas music on the radio and has gotten quite adept at Jinglebells. We are now not allowed to listen to anything but Christmas music in the car. * I have some dates for you to put on your calendars: CRT Early Release Wednesday, November 23rd, No school (Happy Thanksgiving) November 24th and 25th, First Trimester ends Nov. 30th, Human Growth and Development is Nov. 30th, Dec. 7th and December 14th, the Winter Tea is Wednesday, December 7th 10:35-11:00, Winter Party is December 21st at 1 PM (we are hoping it will be a sledding party) and winter break is from December 22nd through January 2nd. We will be taking part in a holiday card exchange with 29 other classrooms in the world. The students will each be creating a snowman themed holiday card by December 7th, so that we may mail them by the 9th. The students can choose what to write in the card and then we will sign all of them. then we just wait and see what we get in the mail, it will be great fun for the stduents to see what shos up and how toehrs celeberate their holidays. I love these opportunities to share the way the students think - I want to find more opportunities like this! Thinking Cap Quiz Bowl Participants and Practice Schedule! Math – We finished unit 3 and did the pre-test for unit 4 today. Unit 4 is all about division so the students need to keep practicing their math facts. Many are tested out for the trimester, which helps them greatly during class. We will start unit on Monday November 14th and the test will be November 29th. This is only a 7 lesson unit. Social Studies – We finished chapter 2 yesterday and are doing our awesome simulation right now on the explorers. Students have to travel the sea to get to the Americas for either Portugal or Spain; survival is not guaranteed. We start groups again on November 14th with chapter 3 that has to do with the Explorers. We also finally did a mystery Skype call with the whole class. It is an incredibly engaging way for the students to use all of their geographical knowledge of the world to determine the mystery place. Reading – We continue our discussion of main idea and details and have also started listening and reading along to Harry Potter. The narration is impeccable and the students are having fun figuring out the hidden meaning of names, which then transfers into their writing. We work a lot on inference in all of our subjects and have many discussions on what we do as great readers; it is wonderful to hear the kids speak of their reading skills, thus developing their metacognition. Writing – This week we finished the examples of types of topic sentences we can use and are moving into transitions sentences. The students have repeatedly shown me that they know what a paragraph consists of. However, when asked why they don’t then use that knowledge in their writing, they replied, “Well, we get so excited that we forget!” Fair enough, I love excitement any day. We will continue with our back to basic writing to get them ready for middle school. Science – We finished our variables unit with the Flipstick Olympics; talk about science thinking in action. The team representing Japan ended up taking the gold. We are in the midst of our first science research paper where we are trying to answer which bubble gum is the best. The students are performing the experiments and trying to either prove or disprove their hypothesis. * These kids make me so proud. I am still getting to know them better and thoroughly enjoying every minute of it. Through the blogging challenges they are giving me their opinions and feedback, which are duly noted so if you haven’t seen their writing take a moment to check it out. * Thank you to everyone who will be donating snacks and drinks next week, it really helps us get through WKCE. * Conferences have started and these are student and teacher led so your child has to come to it. If you would prefer a meeting without your child present, let us schedule another meeting. * Also, thank you to all of the incredible parents that made our Harvest Party such a success. It was a great time for the kids and the food was wonderful. I am humbled by all of the parent support I get. * Don’t forget to practice for the in class spelling bee taking place November 7th through the 10th. The top 4 spellers will represent the classroom at the school spelling bee on December 9th at 8:40 AM. * Dates for your calendar: swimming is November 7th, 9th, 14th, 16th, and 18th. Conferences Tuesday, November 8th through Friday, November 11th, CRT Early Release Wednesday, November 23rd, No school (Happy Thanksgiving) November 24th and 25th. * On a personal note, my brother is finally coming from his tour of duty in Afghanistan. Some of you may remember he came to speak to the kids last year about being a trauma nurse over there and I am hoping I can get him in again. It was a riveting hour long discussion with the kids. To say that we are thankful he is coming home is an understatement. In honor of Halloween, we watched the following video yesterday. We got to do our first Mystery Skype where we called Joan Young's classroom. The kids are already excited about the next time! This is a lot of testing for the kids and a way to keep their energy up is to provide fun snacks for them. If anyone is interested in donating a snack or a drink for any of these days, please let me know. The testing sessions will not take that whole hour but I want to make sure we are not rushed for time. Note that swimming starts this week as well. Math – We are rocking through unit 3 and the unit test will be on November 3rd. The students are working with their protractors and compasses and also learning about angles. I am excited to see the progress in math facts. Social Studies – The second chapter on the early people is in full swing and the students continue working on comparing, contrasting and working on projects tied in with the text. Reading – We have been discussing main ideas and details as it ties in with our writing and we are getting better at summarizing. We use these skills in all of our subjects and the students are feeling more and more comfortable retelling something in their own words. We will be starting Harry Potter “The Sorcerer’s Stone” as our next read aloud which ties in with character conflicts, author’s purpose and themes of literature. I encourage the students to bring in their own copy of the book if they have it and have also ordered copies for the class. We will take the time to dig into the mythology of the book as well, I can’t wait! Writing – This week was all about topic sentences in our writing boot camp. Students have been given 3 different types of topic sentences to use as they write. They have been browsing articles to look for great topic sentences and are getting more critical in their approval of them. We love going back to basics and I get a kick out of “this is so fun!” that I hear in the classroom. * We continue to just have a blast learning. Today, during science when the kids were working on challenges it just was incredible to see them work together and also to hear all of the great ideas. They are becoming critical problem solvers and learners, what an adventure it is. * Next week will be a short one with a lot of learning packed into 2 ½ days. We will watch Tuck and compare it to the book, we will wrap up flip sticks in science and get ready for the flip stick Olympics, we will continue our boot camp delving into concluding sentences and of course have a lot of fun. * The harvest party is On Wednesday with food and games. The students may go to any classroom to participate; Mr. Meinholz will be playing kickball, Mr. Getz will have board games and we will have other types of games. * The students are busy blogging and we have been asked to be blogging buddies with a classroom in England who are just learning how to blog. Please take a moment to leave the kids a comment; they work so hard on their blogs. * Spelling Bee word lists went home this week, I do not require the kids to participate in the classroom spelling bee, but if you would like your child to participate please let me know. The top 4 will go on to represent us at the school spelling bee on December 9th. * The tie-dye shirts went home yesterday and instructions on what to do next are posted on our web site. Tuesday is wear your tie dye t-shirt to school so mark your calendars. * Thank you for signing up for conferences, most of you should have received a confirmation from me, if not, you have either not signed up or we are still figuring out a time. * WKCE info went home today and dates have been set: November 7th – 10th we will be testing math and reading. Written, performed and created by the students. As a culminating project on chapter 1, students created a video on the Southwest Region using all of their facts. The annual spelling bee is coming up and today the students were given the word list to study from Ms. Weber. In our room participating in the spelling bee is optional, however, if you would like to have your child participate and study the words, please let me know. The top 4 will be representing us at the school spelling bee on December 9th at 8:40 AM. 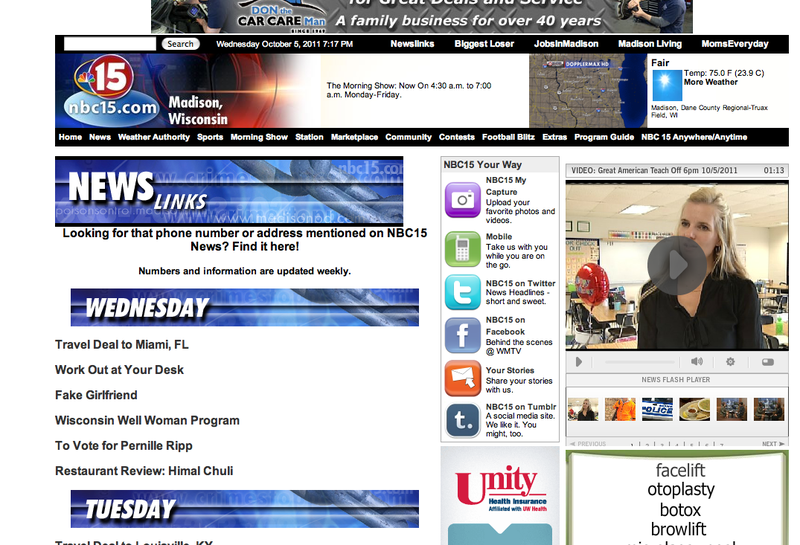 To sign up for a conference, click on the button below! This was reading today, on Thursday they finish creating and then perform (which I will tape and share). Today due to a great debate piece in Time For Kids, we discussed internet safety and how old students should be to get on Facebook or other social media sites. It is wonderful to see how aware the students are already about how to create an online identity, as well as how to protect themselves. We are also learning how to discuss appropriately without raising our hands, which is a life skill. We finished the discussion with watching the video below which is slightly creepy but really gets the point home of how to stay safe. Math – We are in the middle of the second unit which is all about numbers. We have worked with adding and subtracting whole numbers with decimals and will soon start to work with multiplication of such numbers. Students need to know their math facts so please have them practice if they are not secure in the. Social Studies – We started our new social studies curriculum this week with projects, discussion of reading strategies, particularly compare and contrast, as well as projects for some. We love how we are getting to work with smaller groups, really focusing in on the comprehension strategies as well as all of the great information for them to explore. Groups will be reshuffled every chapter depending on how a child needs to be challenged. Reading – The second week of the Global Read Aloud has been great. We skyped with three 4th grade classrooms in Ohio, who had wonderful questions for us and we did a lot of predicting and summarizing in here. Our buddies in South Korea also created a video for us, which can be seen on our website. We are currently working on the strategy of asking questions, which the students are very good at. Writing – We are still blogging, the students know that they can ask to blog during recess and many are taking me up on that opportunity to not have to do it at home. We are also journaling, where I encourage the students to use more difficult words and simply circle them if they are unsure of the spelling. Most kids are finding enough time in the morning to get their spelling work done, however, some are handing it in late. They all have the option of bringing it home and work on it there if they feel they need more time. Spelling is an essential skill for all people and it is something they have to practice. Science – We are halfway through variables and had a lot of fun with our lifeboats this week. Students created hypotheses, tested them and then graphed their results to make predictions. We are working on using our science language to show our understanding as well. * Our video goes live on Monday and I will send the link for you to vote on it (if you want to vote for us). It was incredible for me to hear what the kids would spend the $10,000 on if we won. They had ideas from fun stuff like tree houses, carpet, more computers to things like more books for the library or fixing the gym floor. * Blogging is going really well and we now have gotten more than 400 comments on the blogs. I am in touch with several teachers across the world that are watching our blog for ideas and to see how the kids are developing in their writing. We had a 3rd grade classroom constructively critique our blog posts this week, which was a wonderful learning opportunity for all of the kids. We will be doing the same for them. * We are having some issues with filling out assignment notebooks in the switching of the rooms so for the month of October all students have to have their assignment notebook checked by their math and social studies/reading teacher. This is to secure the habit of writing down your homework in the room you are in but after October the responsibility falls back on the student. * The students were great with the sub and I am finally feeling better. I am so looking forward to a full week with the kids next week with no sub in our room. * Dates for your calendar: PTO Back to School Hawaiian Party Night is Friday, September 30th 6 PM, Scholastic Book Fair runs October 10th through the 13th with family night on the 11th, Picture Re-Take day is October 21st , CRT is Wednesday, October 27th and No School Thursday October 28th and Friday, October 29th. Writing Prompt: Choose two land regions you have read about in this chapter. Then write a report that compares and contrasts the two regions discussing climate, geography, landforms, and lifestyles. Tell about the history of the land regions, as well as what makes them a region. Provide facts, details, and examples in your report. Step 1. Compare and contrast your two chosen land regions by recording their similarities and differences in a chart. Include differences in climate and geography. - Look at the region map on page 16 and 17 for clues. Use other illustrations to gather more information. - In your textbook, find descriptions of what makes a region its own and what sets it apart. Step 2. Use your chart to make an outline for your report. Think about how to organize the information. Include an introductory and a closing section. Step 3. Use your outline and chart to write a draft of your report. Make sure you are highlighting similarities and differences between the two regions (compare and contrast). Step 4. Review your work to make sure you have divided the information into paragraphs by topic. Also, check to make sure that used correct grammar, spelling, punctuation, and capitalization.